Breakfast is the most important meal during the day, it should contain multi-fibers, fruits and dairy. You can skip your dinner, eat light lunch, but never skip your breakfast, it is important to start your day with energy and to be healthier. fruits are advisable to be before 2:00 PM as if you have it later on you wont benefit from its vitamins, I don't know if it is true or not but that what I've always read about it. Looks soo tasty I love breakfast the most important meal also. People need to realize that when they sleep their metabolism slows down, slows down the bodies functions. You need to eat Break fast(meaning break the fast) to get your body pumped up and ready to go. 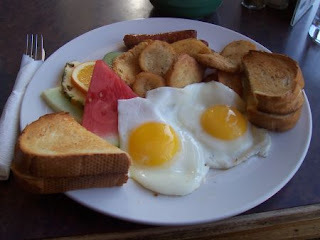 I am missing breakfast those days! !